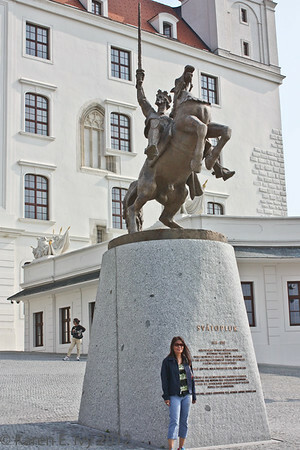 Our next stop after Vienna was Bratislava, capital of Slovakia. Frankly, I found Bratislava intimidating, because it was the first time I’d ever been in a country where the written language (on signs and so on) made no sense to me. I understand enough German and French to get by; in Amsterdam the language was close enough to German for me to guess at meaning (don’t tell the Dutch that! ); anybody who lives in California has some idea of Spanish. But the Slavic languages are a mystery to me. Fortunately everyone I really needed to talk to spoke English. 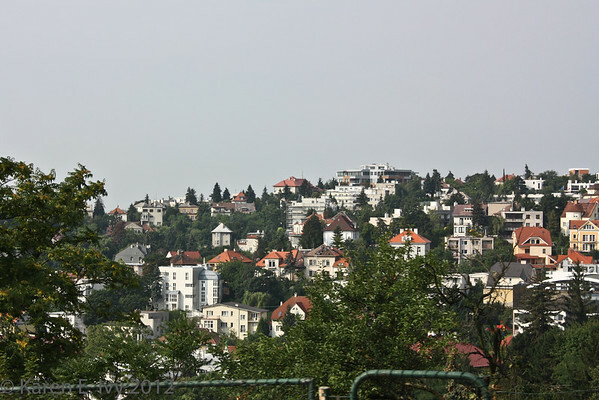 The earliest recorded town in this location was founded by Celtic tribes around 200 B.C. ; when the Roman Empire expanded this far north, the town became part of the Limes Romanus, or the border of the Empire. The town has had at least four names over its history; the country has only been independent since the Velvet Divorce in 1993. 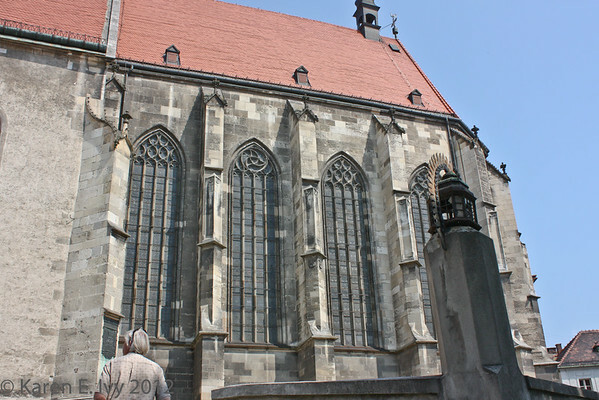 The full photo gallery of this stop is Bratislava. If you want a closer look at any of these pictures, go to the gallery and click on the image to select it; then you can double click on that to go into the lightbox and pick what size to enlarge it to. 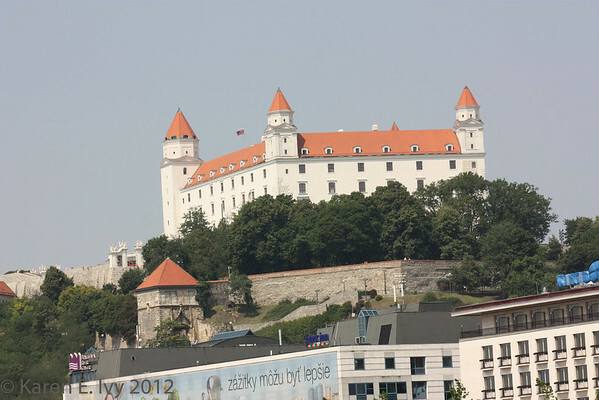 Bratislava castle, originally a defensive fortification, is on a plateau 279 feet above the Danube. 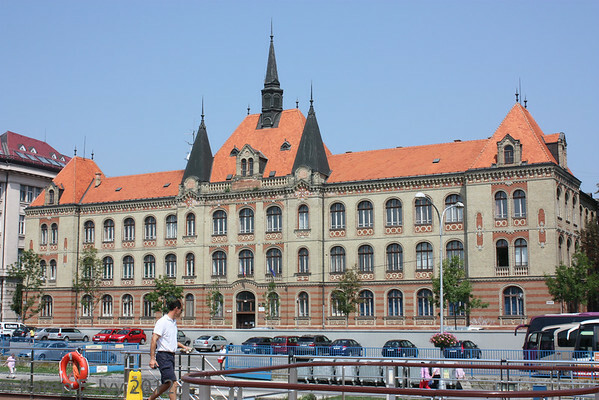 It wasn’t a stone castle until some time in the 10th century, when the area was part of the Kingdom of Hungary. It’s been rebuilt several times, the last time in 1649 in the baroque style; by then, of course, it wasn’t an active fort. It accidentally burned to the ground in 1811, and wasn’t rebuilt until the 1950s, when it was rebuilt as it had been under Queen Maria Theresa in the mid 18th century. 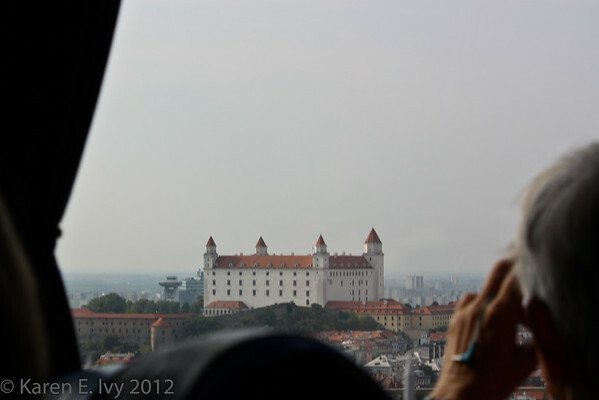 Bratislava Castle, from the bus, slightly above and behind it. I have a better picture of it later in the gallery, but this was our first view of it. 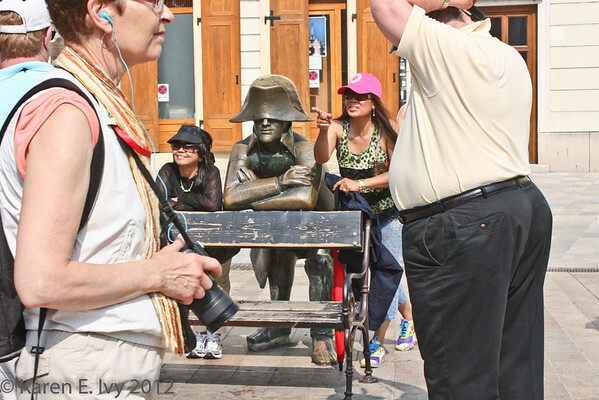 Our “walking tour” started, as they often do, with a bus tour. 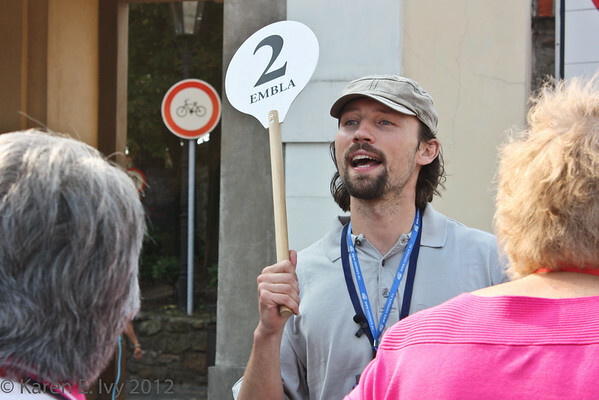 Our tour guide was a very charming local man called Miroslav, here he is. English was clearly a second language for him, but he was not only fluent, but witty and amusing. You try being witty in a second language. 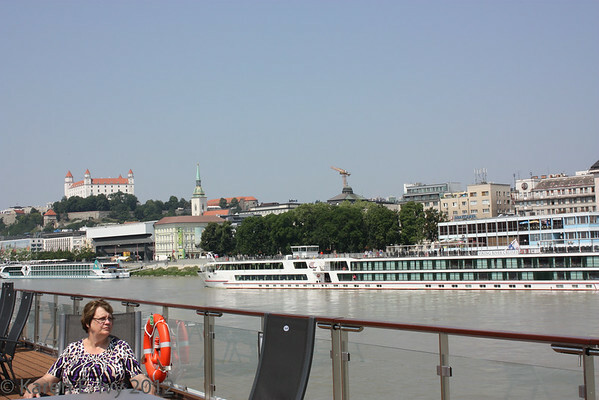 The tour was entirely on the north bank of the Danube, which is the hilly bank; the south bank, which we didn’t get to, was visibly flatter; you can see we’re looking down as well as out. 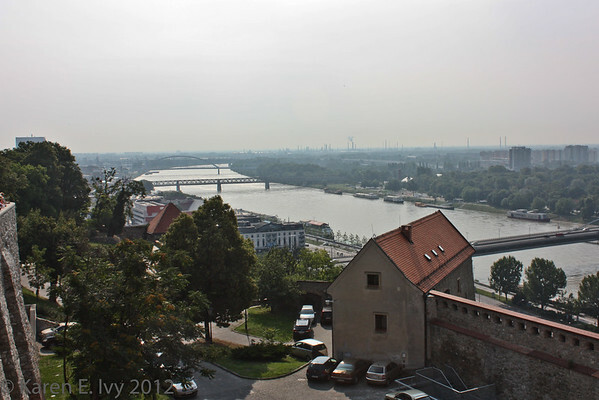 This photo was taken from Bratislava Castle. Otherwise it’s just a paved area. 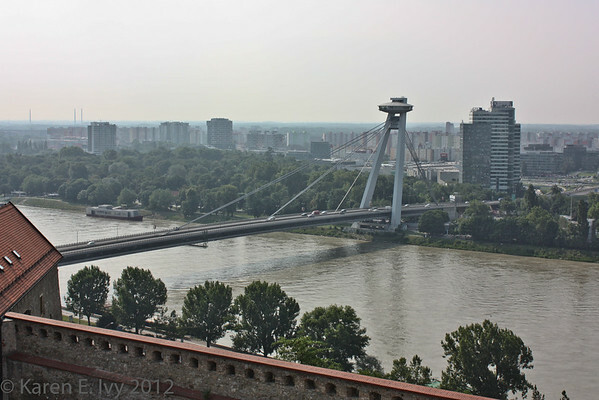 It does have a fabulous view, including this view of the New Bridge (Novy Most) over the Danube, known locally as the UFO bridge and restaurant. We didn’t have an opportunity to dine in the UFO. 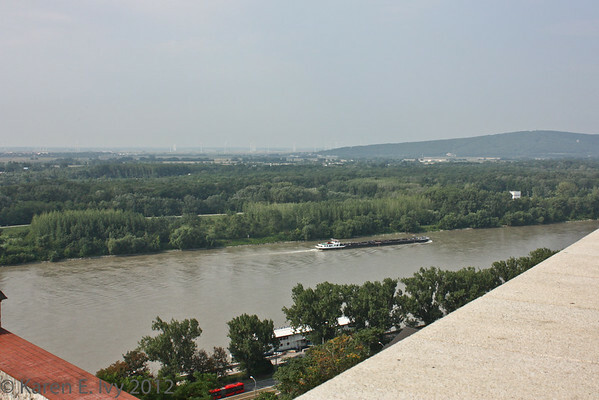 Here’s the lower courtyard and the view down the Danube. After we’d taken the photos we wanted from the castle walls, the bus took us down into the old town and dropped us off to walk around. 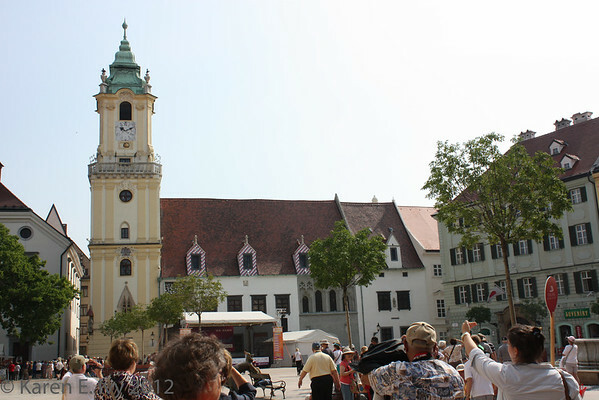 Bratislava is a very walkable town, with the usual European buildings stacked right next to each other – nobody here has visible yards – and about 5-6 stories high, which is as high as you can reasonably climb. Old European buildings mostly predate the elevator. That’s why garrets were so cheap for artists. 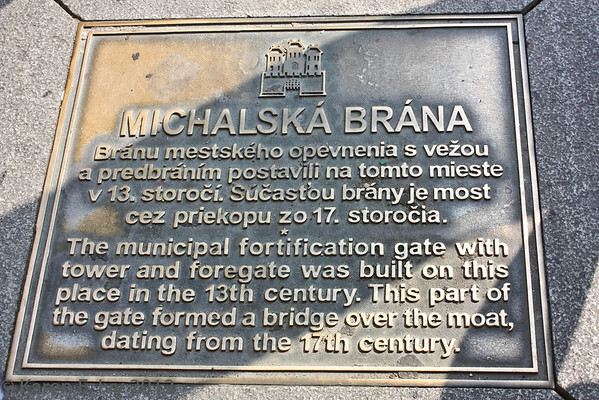 Our next stop was St. Michael’s Gate, part of the original 13th century town fortifications. People seem to call it “Michael’s Gate,” as often as they say “St. Michael’s Gate.” If you count windows, it’s 7 floors to the clock tower at the top; but then, soldiers were supposed to be tough and able to climb stairs. 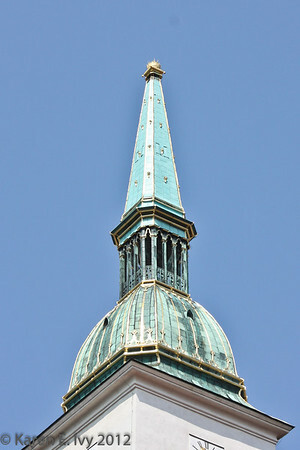 There are a couple of better views of the clock tower in the photo gallery. 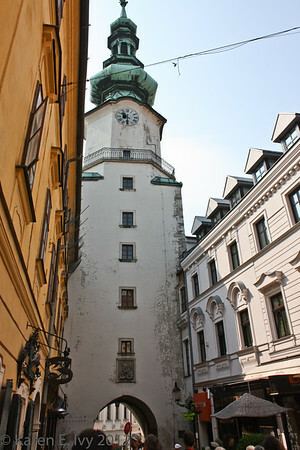 The Old Town Hall had a door in it, with a sort of mini-door on one side. 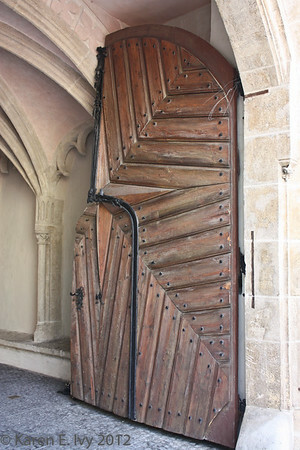 I saw a similar door in Rothenburg, where it was actually enclosed all the way around by the main door – they called it an “eye of the needle” door, and it was used there for letting latecomers in after the main gate had closed. 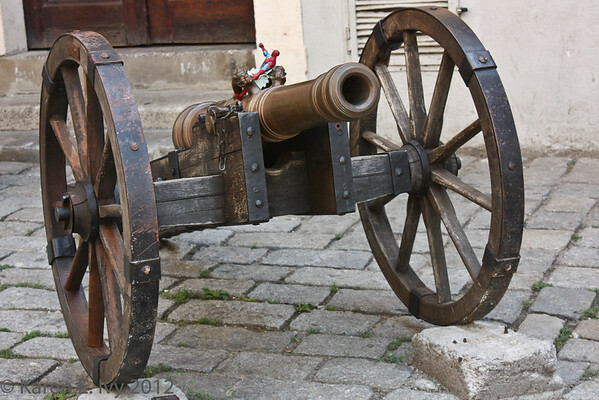 Since I doubt the Bratislava Old Town Hall was part of the original town fortifications (it doesn’t look like it), this may have had some other use, but when I saw this I thought of the other one. 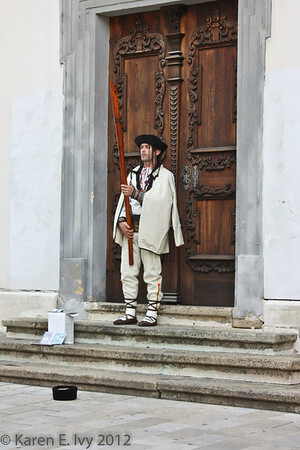 I don’t recall a lot of street musicians, but we did see one young man, in traditional costume, playing a fujara. We thought at the time that it was a contrabass recorder; Wikipedia says a fujara is a “large sophisticated folk shepherd’s overtone fipple flute of unique design. It is technically a contrabass in the tabor pipe class.” I think that means we were right. [The crown] weighs 150 kg (330 lb), measures over 1 m (3.3 ft) in diameter, and rests on a 1.2 m × 1.2 m (3.9 ft × 3.9 ft) gold-plated pillow and stands 1.64 m (5.4 ft) high. 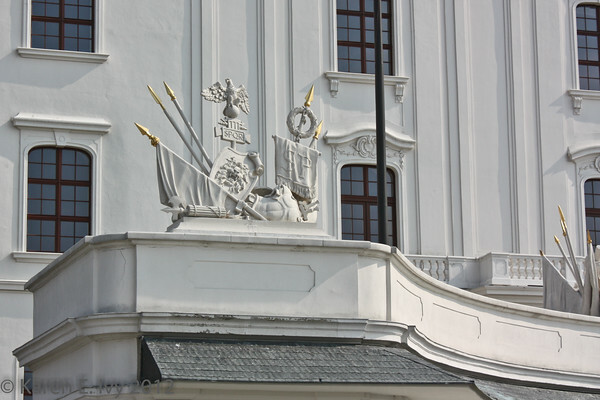 The pillow and crown contain a total of 8 kg (18 lb) of gold and were restored in August 2010. 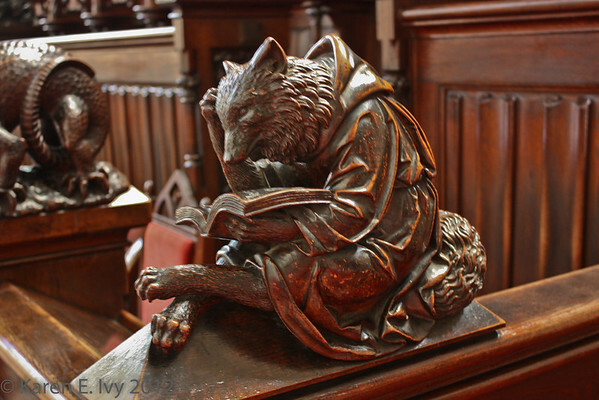 As you can see, this charming fox is not only reading a book, he’s scratching his head over it. 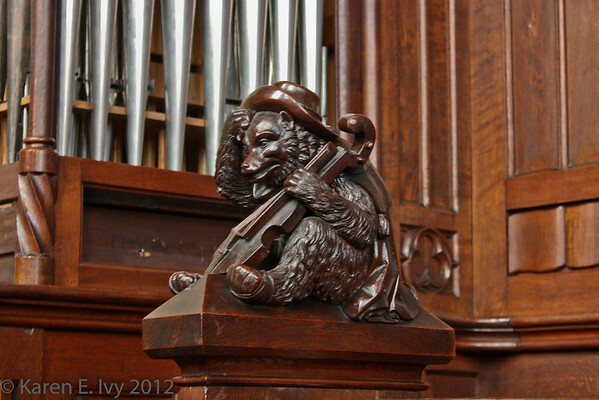 And who could resist this puzzled bear with his fiddle and hat? There was no sign saying when these were done, so I have no idea how old they are, but they don’t look worn, they’re very fresh and beautifully polished. 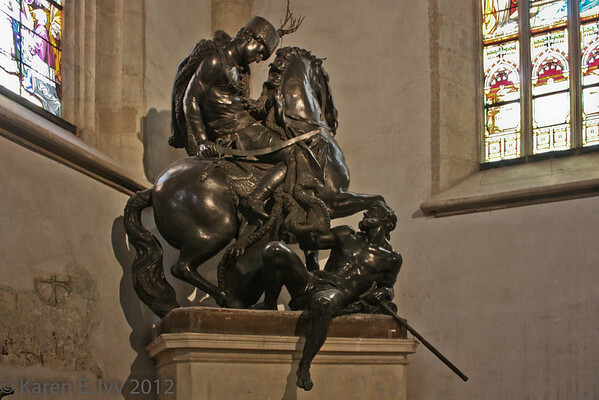 The other decoration of note is the statue of St. Martin, giving his cloak to a beggar. 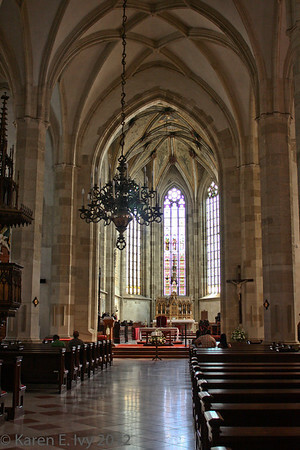 After touring the church we went back downtown. 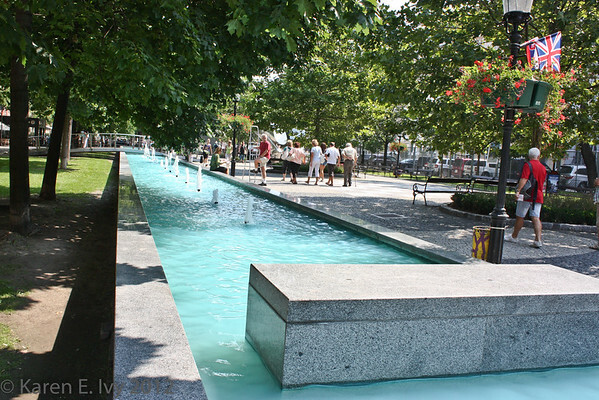 The main square is the usual formal layout but near it they have a sort of picnic area, centered around a long fountain. This is clearly the hangout. It was full of people strolling, not just us, and family parties sitting around under the trees. It also had some, um, unusual public art. I couldn’t bring myself to take the frontal view of this statue but you get the idea from this. 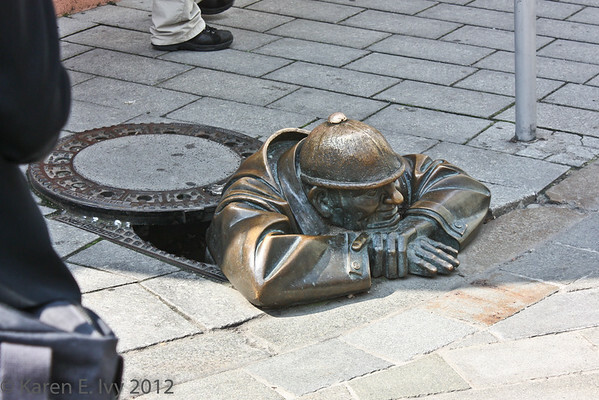 But I also loved the man in the manhole, with his expression of mild, genial interest. 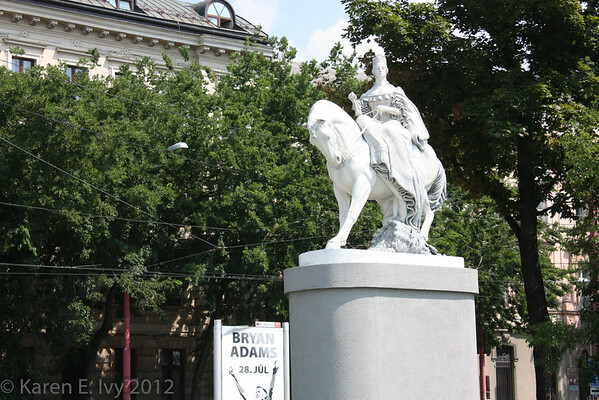 There were some other interesting statues; they are the last 5 photos on the last gallery page. One of them is a 10 foot statue of Uncle Joe Stalin, just standing on a street watching people go by. I wouldn’t have thought people who had lived behind the Iron Curtain would want to memorialize him, but I got the feeling they thought it was funny. 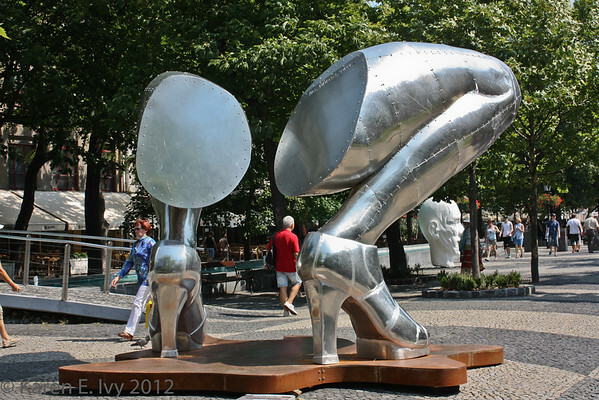 These statues are part of the reason I really liked Bratislava. A citizenry which would put them up is worth getting to know. After having a lemonade at a drink stand in the promenade, it was time to go back to the boat. The lemonade stand, I’m sorry to say, also sold Pepsi and Red Bull. You’ll see some farewell photos, including the building of the Slovak Philharmonic; unfortunately we didn’t have time to hear a performance. It was a beautiful building, but it doesn’t look anything like the concert hall they show on the Wikipedia page. On the way back to the dock, we passed an equestrian statue of the Empress Maria Theresa, and a very nineteenth century government building. From the dock I got the best photo of the Castle. Here’s my farewell view, from the Embla sun deck, showing the castle on its plateau, St. Martin’s just down the hill, and buildings along the riverfront. Not to mention another river boat or two. After this we were off to Budapest and home. 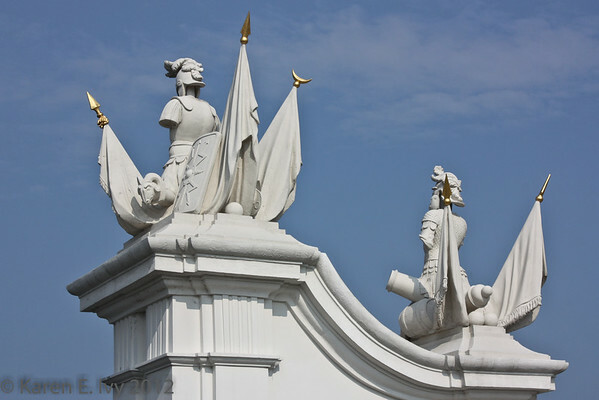 This entry was posted in Personal, Photography, Vacations and tagged 2012 Vacation.